Register for the 2016-2017 Fighting Illini Kids Club today! Your Kids Club membership will include a membership card, t-shirt, pillowcase, seasonal newsletters, and much more along with two complimentary tickets to a 2016 Illinois Football game this fall. 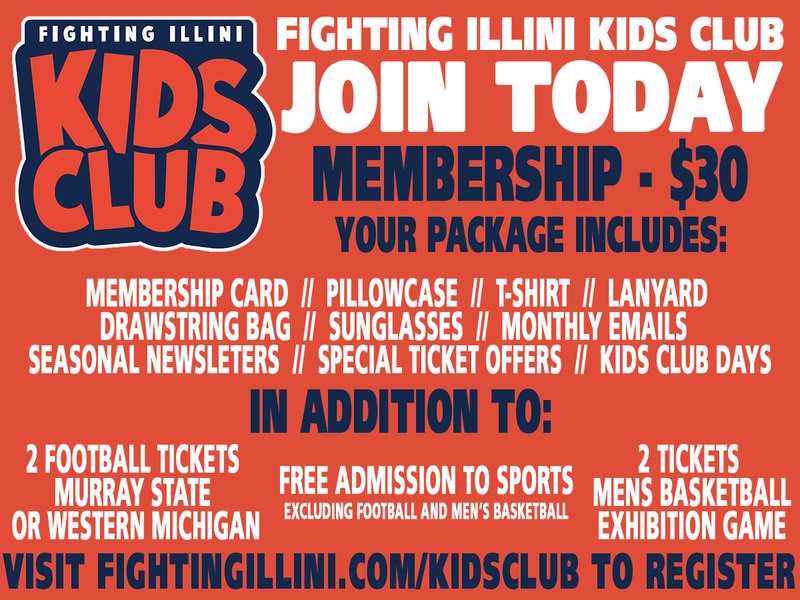 For the full list of benefits, more information and to register, visit fightingillini.com/kidsclub today! Thanks to University of Illinois Athletics for sponsoring this edition of our Weekend Planner. How much: Admission prices vary throughout the week. Check here for prices. Why you should go: This is annually one of our favorite fairs, and Thursday, July 14 might be the best day of the fair. Check it out: $2 midway rides (tough to beat that); plus the Power Wheels Demolition Derby for Kids (ages 4-5 and 6-8) at 6 p.m.; and then, at 7 p.m., is the Lawn Mower Demolition Derby. How much: Admission: $5.00 per person (10 & Under Free with each paid Adult) Parking: $5.00 per vehicle (limited space) CASH ONLY! Free Shuttle Bus service will be offered. Why you should go: Back after a 15 year long hiatus, Balloons Over Vermilion will feature thirty hot air balloons launching and tethering, as well as mass ascents, fly ins and balloon glows. If that isn’t enough, there is also a Kids Zone with bubbles, face painting, and more! Why You Should Go: We love local youth theatre! Roald Dahl’s Willy Wonka is a scrumdidilyumptious musical guaranteed to delight everyone’s sweet tooth. Great for kids of all ages. When: Saturday, July 16, from 9:30 to 11:30 a.m.
Why you should go: This month’s topic: Explore the senses. Sprouts will create a dip station in which children can create their own dip “base” to go alongside samples of fresh fruit and veggies. Engaging the children in the process will activate the senses of sight, smell and taste. Why you should go: Come meet Winnie the Mini Horse from the book Winnie the Mini! Winnie will do “hoof signings” while while Andra Ebert does a reading of this fun children’s book. Why you should go: Visit downtown Champaign for live local music and food. Other activities include face painting, balloon animals and sidewalk chalk. TCBY and the Snack Shack food truck will be on site. Weekend Planner features only a few of the wonderful events happening in our area. For a full list, please visit our Events Calendar, sponsored by Busey.